I hosted my annual cookie exchange this past week end, and it was such a happy festive evening with special friends, along with cookies galore and then some. While cookies are always the focus of the party, I like to have some appetizers to balance out the sweet. With all the baking, I wanted appetizers that did not need much prep work and require use of the oven! 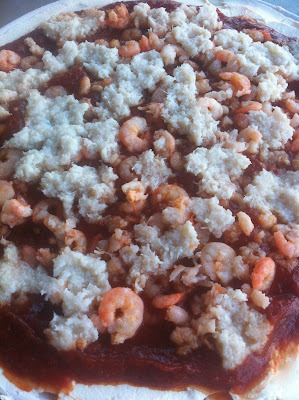 My mom makes this shrimp and crab dip for New Year's Eve, and it always is demolished quickly! I thought it would make a great appetizer for the cookie party because it is so easy to put together. Besides, doesn't every party need a dip of some sort? It almost looks like a pizza once it is finished, and the red and white colors are festive for the holidays, too! Everyone at the party enjoyed the dip. People would get one cracker with dip, and once they realized how good it was, they went back for more! These simple ingredients just meld together for great flavor. If you're looking for an easy appetizer to bring to those holiday parties, this shrimp and crab dip takes less than five minutes to put together and requires only minimal ingredients. Grab a box of crackers, and you'll be good to go. On a large plate, spread cream cheese over plate. Next, spread the cocktail sauce evenly over the cream cheese. Then, add the shrimp and crab. Serve with crackers. Mmmm, now you're talking! I could eat a whole bowl of this myself. Great recipe. It's so easy to put together! :) I hope you are enjoying the Christmas season! Well now isn't this interesting! And it sounds so good. I must try it soon. Thanks for sharing the recipe. Pinned. Sous Chef would love this - will be trying this in January!